This page aims to help you remove Native Desktop Media Service “Virus”. Our removal instructions work for Chrome, Firefox and Internet Explorer, as well as every version of Windows. We recommend you familiarize yourself with Native Desktop Media Service before jumping to the removal guide, which can be found in the second half of the article. Native Desktop Media Service “Virus” is an adware program, similar to other applications with ad-generating abilities, which tend to display various intrusive ads, banners and pop-ups on the users’ screen. This software only provides benefits to its owners/creators through Pay-Per-Click campaigns and causes a number of inconveniences for the computer users. The so-called Native Desktop Media Service “Virus” often appears in the computers without the permission of the customers. It belongs to the adware category and spreads like any other potentially unwanted program – usually in a package with free software. Once it gets into the system, this program has the ability to add itself to any browser installed on the computer and install a new homepage, a toolbar or a search engine on it. As a result, Google Chrome, Mozilla Firefox, Internet Explorer or any other default browsing app may start to generate enormous amount of popping ads during each browsing session. The only way to remove the different types of online ads that offer multiple deals and discount codes on your screen is to remove Native Desktop Media Service “Virus” from your system. On this page, we will show you exactly how to do that, so stay with us and read the information below. In it, you will find some useful tips about Adware and its nature as well as a free Removal Guide with proven steps which will help you uninstall Native Desktop Media Service once and for all. Reboot in Safe Mode (This step is optional). Is Native Desktop Media Service A virus? If every time you open your browser you see ads labeled as “Ads by Native Desktop Media Service,” “Brought to you by Native Desktop Media Service,” “Powered by Native Desktop Media Service” or something similar, it may not be a good idea to click on them. Typically, these are sponsored advertisements, which try to encourage the users to open them because each click generates a certain amount of money for the creators of the adware program. The sole idea behind such activity, as you can see, is to bring profits from sponsored redirects and exposure to paid commercials. It surely can be quite irritating to deal with tens of nagging blinking boxes and popping banners every minute or so, yet, technically and legally speaking, Adware programs are mostly legal pieces of software. In fact, Adware is seen as legitimate advertising software which may be quite annoying, but in, most cases, not malicious. So, if you are thinking that your browser has been infected with a nasty virus, relax. Native Desktop Media Service “Virus” is nowhere near as noxious as threats like Ransomware and Trojans and will not harm your PC in a serious way. Still, you need to be aware of the possible inconveniences you may encounter if you keep such software on your computer. That’s why here we will reveal the most probable issues you may face. 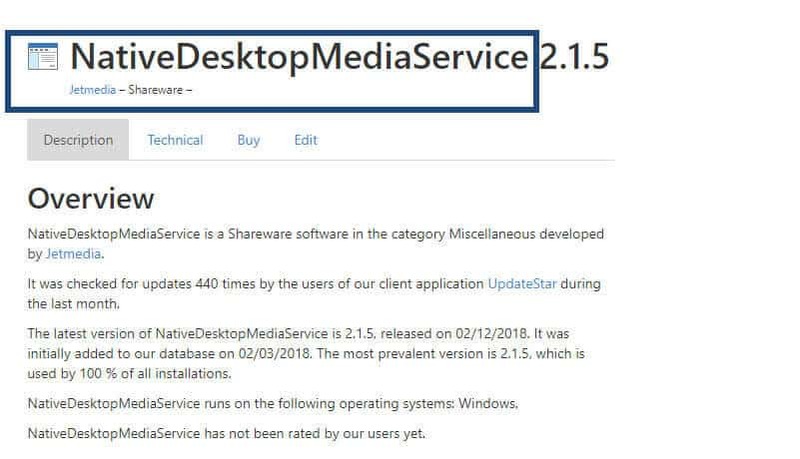 The most obvious problem with Native Desktop Media Service “Virus”, as well as with most other programs of the Adware type, is the aggressive generation of commercials all over the screen and the possible redirection to various sponsored websites. Most of the displayed suggestions may look reliable and could contain seemingly amazing offers. Still, it is a good idea to keep in mind that some of the pop-ups may contain suggestions that might look solid on the outside but are actually fake and misleading. They may appear on your screen for the sole purpose of making you visit certain web pages that are actively seeking to increase their number of visitors and/or their page rank. As a result, you may end up losing your time clicking on click-baits, which may redirect you to questionable web locations. This is actually one of the lesser problems that you may face with Adware. The unwanted program may also track information for the browsing activity of the users with the purpose of providing them with interesting and relevant content (targeted advertising). After scanning and analyzing the user’s searches and frequently visited web pages, Native Desktop Media Service may deliver ads, based on the customer’s interests, thus increasing the potential for more clicks. Bear in mind, though, that some of the ads, which may get displayed on your screen, may be potential transmitters of real viruses and nasty malware the likes of Trojans, Ransomware, and Spyware. For this reason, we do not recommend that you trust the adware and click on its content. For your safety, it is better to immediately remove the annoying software from your computer using the Removal guide below or the help of the professional Native Desktop Media Service removal tool that we have suggested on this page. After all, it is really not worth the risk of bumping into some nasty infection just because you have not uninstalled the adware on time. Symptoms This program may start to generate enormous amount of popping ads during each browsing session. Distribution Method Free software bundles, automatic installation managers, spam messages, torrents, free setups and download links.